It’s a sunny day here in France and tomorrow I will set off before dawn to drive to Barcelona. It is about 650 miles, but I should get there in the middle of the afternoon in time for a wander around the F1 Paddock and a few chat to find out what’s going on. That’s the plan. It is one of the most enjoyable days of my year, heading to the first European F1 race – a sign that the spring has truly arrived (although it has been known to go through snow on the way). France is a spectacularly beautiful country, endlessly varied, and filled with surprises. I should probably take two days to do the journey and explore a little more, but time is always pressing. The weather forecast is good and I will go straight down the middle of France: by way of the Beauce plains, the forests of the Sologne, the Bourbonnais bocage in the Allier and then on to the volcanoes of the Puy de Dome, close to Clermont-Ferrand. By mid-morning I will be climbing up the road they call la Méridienne into the Cantal and the Lozere, passing such things as Eiffel’s spectacular railway viaduct across the Truyere river, near Saint-Flour, and then the astonishing viaduct at Millau (one of the modern wonders of the world), in the Aveyron, just before lunch. The road is a spectacular piece of construction, running at over 2,500 ft most of the time, with large sections above 3,200 ft.
After the high plateau of Larzac, one dives down the Pas de l’Escalette, a pass that drops 1500 ft to the coastal plains of the Languedoc and a sunny drive along the coast to Perpignan before climbing again over the Pyrenees until I get to the gentle wooded hills of Catalonia. So don’t expect much blogging tomorrow. Yes, I know, I’m living the dream, and I do appreciate the life I have. Everyone involved in Formula 1 is living a great life, even if we work and travel hard. The trouble with living the dream is that someone has to pay for it. Readers always assume that there is some omnipotent media mogul in the sky who pays the bills for me and everyone else. It does not work like that. A lot of the F1 media pay our own bills, which is quite eye-watering when added to the costs of normal life. A few folk have mentioned that my new books (the two volumes of Fascinating F1 Facts) are a little expensive. I accept that they are, but I look at it slightly differently. Every day thousands of F1 fans read this blog or listen to me podcasting (there is a new one by the way). It costs them nothing. Paying a little extra for a pair of books (which any F1 fan will enjoy) is a much better way to generate revenues rather than putting everything behind paywalls. So, if you want to buy the books but think it is a little too expensive, think of it as a way of saying “thanks” for the content you get for nothing. If everyone who reads the blog and listens to the podcast bought the two books today (in my dreams), I would never need to worry about funding again. Ever. It is really is that dramatic… So, think about it, if nothing else. And if you think: “Yes, that’s a reasonable argument” then clink the link and guarantee that the blog, the green notebook, the podcast, the audiences and so on will go on until the day I drop off the perch. 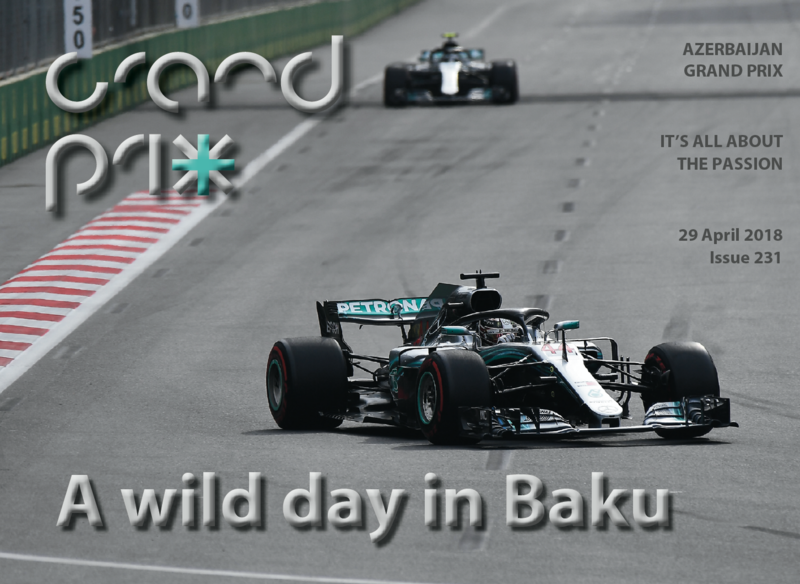 The Azerbaijan Grand Prix was a real humdinger of a motor race, with twists and turns and shocks – and shunts, all of which went to prove that the show isn’t over until they wave the chequered flag. Victory went to Lewis Hamilton, but it was not a usual Lewis win, this was a lucky win, but he took it, just as Vettel took a lucky win in Australia. When it comes to fighting for titles, you take every point you can get. The good news for F1 was this was yet another great race, with Ferrari looking like a likley winner until Valtteri Bottas snuck away at the front, making his tyres last in an impressive fashion. He was in the running when the two Red Bulls wiped each other out in spectacular fashion and a Safety Car was scrambled. That gave Valtteri a free pit stop and suddenly he had victory inthe palm of his hand, if he could hold off Vettel, who was running behind him. At the restart Vettel made a huge move but it all went wrong and he went wide at the first corner. He avoided hitting the wall (just) but by the time he had scrambled back on track he was behind Bottas, Hamilton and Raikkonen. A lap later Bottas had a puncture and was out, leaving Lewis in charge, while Sergio Perez did a remarkable job to overtake Vettel and grab third. Further back Carlos Sainz was fifth ahead of the Sauber of Charles Leclerc, who drove an excellent race and Fernando Alonso who grabbed sixth on the last lap by forcing his way ahead of Lance Stroll’s Williams. The final points went to Stoffel Vandoorne and Brendon Hartley in the Toro Rosso. – Will Ferrari really quit Formula 1? GP+ is the fastest F1 magazine in the world. It’s so fast, it’s almost real-time. But it is a magazine that tells you the full story, like racing magazines used to do. Yet it is published in electronic form in PDF format, so you can read it on a laptop or a tablet. Our reporters are some of the most respected in the business and we take you behind the scenes in the F1 paddock and explain what is really going on. We have forthright opinions and we don’t care if we knock noses out of joint. There are plenty of fascinating stories from Grand Prix history as well, plus great photography and old style reporting, giving you a blow-by-blow account of what happened, both in qualifying and in the race, so you have a proper record which can stay in your computer for years to come. You get 23 issues for &pound;34.99, covering the entire 2018 Formula 1 season. 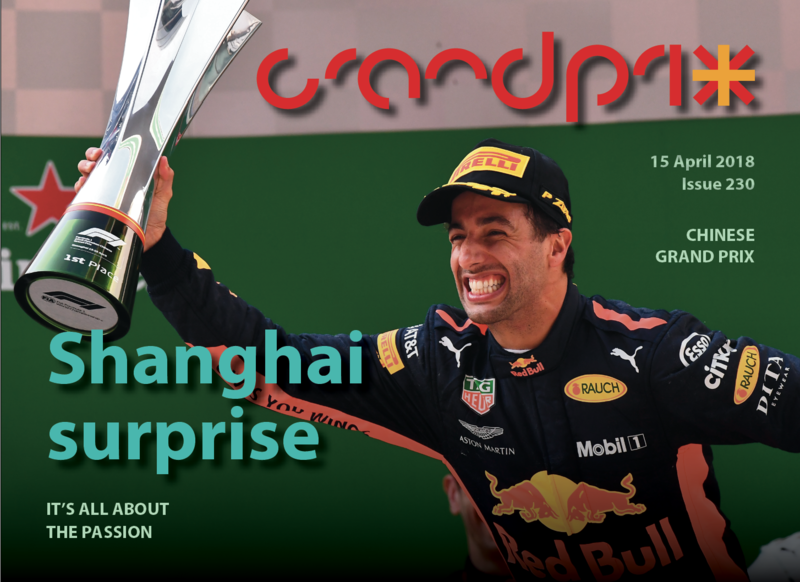 Daniel Ricciardo (Red Bull-Renault) on the podium with his shoe after the 2018 Chinese Grand Prix at the Shanghai International Circuit. Photo: Grand Prix Photo[/caption]The 2018 season is getting more and more exciting. In China it looked like Sebastian Vettel was in a very strong position until the pitstops when he was jumped by Valtteri Bottas in fine style. Then Bottas looked to be on his way to glory until the two Toro Rossos collided and a Safety Car was despatched. Red Bull reacted instantly. Mercedes did not. They could not have helped Bottas because he was past the pit entry before the Safety Car was declared, but if they had called in Lewis Hamilton (who was racing between the two Red Bulls), he might have become a challenger later in the race. Instead Max Verstappen and Daniel Ricciardo suddenly burst into the game. Bottas and Vettel were on older rubber but had missed the chance to pit. Verstappen was too forceful (again) and ended up colliding with Vettel. Ricciardo was more measured and took the lead from Bottas with a glorious overtake on lap 45. It had been a great race, with great scraps down through the field. 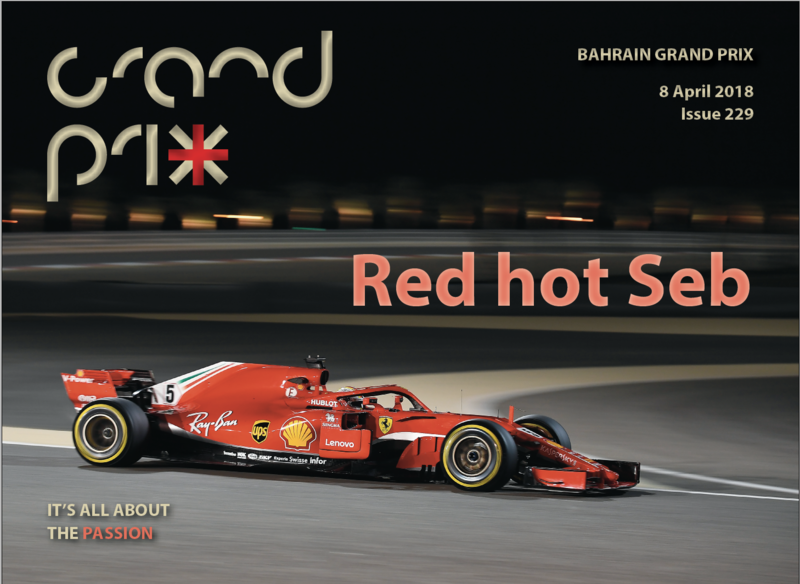 GP+ is the fastest F1 magazine in the world. It’s so fast, it’s almost real-time… But it is a magazine that tells you the full story, like racing magazines used to do. Yet it is published in electronic form in PDF format, so you can read it on a laptop or a tablet. Our reporters are some of the most respected in the business and we take you behind the scenes in the F1 paddock and explain what is really going on. We have forthright opinions and we don’t care if we knock noses out of joint. Peter Nygaard works magic with his Nikon. Lewis Hamilton looked to have everything under control in Albert Park, after a sensational qualifying lap on Saturday. Ferrari was powerless to stop him, its only hope being a Safety Car. And guess what happened… The two Haas-Ferraris both went out with wheel-nut problems and a Safety Car was sent out Sebastian Vettel was able to get an advantage in the pits and emerged ahead of a confused Lewis Hamilton and a bemused Mercedes engineering team. After that it was all about track position and Vettel made no mistakes. It was a good win, but an incredibly fortunate one. We look at who did what in Australia and what it means for the season ahead. 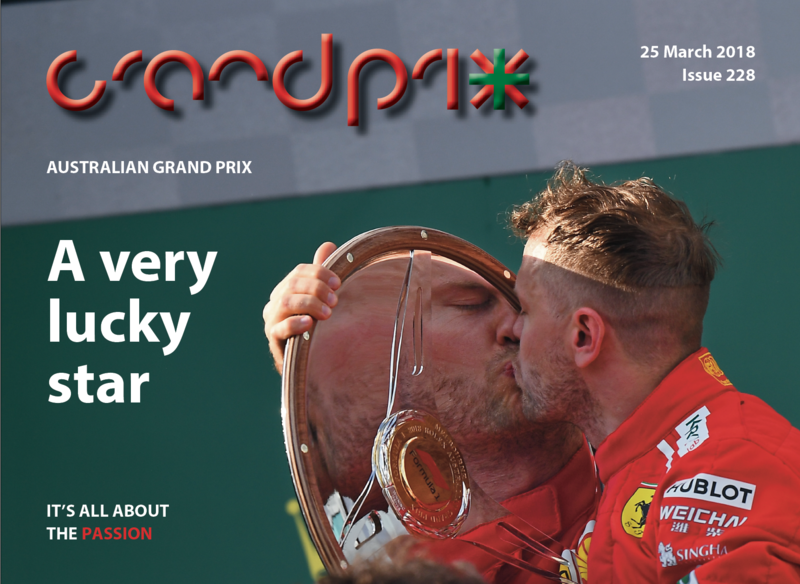 If you are going to go to Melbourne for the Grand Prix and want something to do on Friday evening, why not buy a ticket to my annual Audience with Joe, a chance for F1 fans to ask questions – and to meet other F1 fans. There is no shortage of subject matter at the moment with the halo, Liberty Media and all the new cars. The event will be at the West Beach Bathers Pavilion, located at 330A Beaconsfield Parade, St Kilda, which is right down on the beach. It is within easy reach of Albert Park by tram and a pleasant walk from the Canterbury Road entrance, if you prefer. The event will kick off at 7pm on Friday, March 23, and it will run until 11pm, with food and drink available throughout the evening at normal bar prices. The tickets cost A$70 and there was a big turnout last year, so it is best to book early as the number of tickets is limited in order to ensure that everyone has a chance to ask their questions. We are expecting a sell-out crowd, so don’t leave it to the last minute. You might not get in.